I was craving some DIY fun, so I didn't want to have a standard coat rack from Ikea installed. 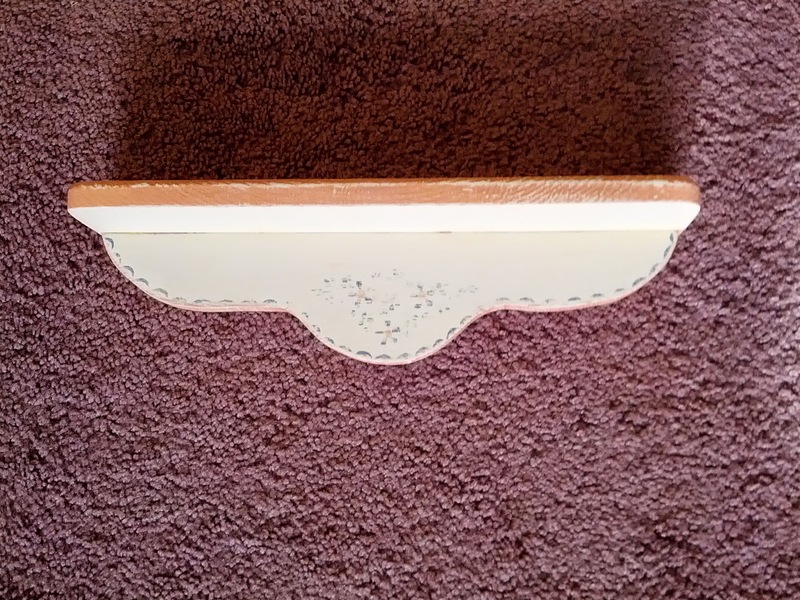 I found this little shelf at the thrift store for 50 cents, so I went for it. The 2 pieces of wood were originally attached with hot glue (terrible for wood!) & were falling apart so I removed the glue & attached them using Elmer's wood glue. 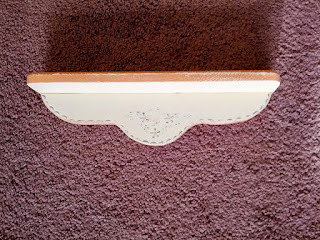 After it set, I did a little sanding because the little flower details were a bit raised & I wanted a more even surface. So...I made the mistake of marking & drilling my little shelf AFTER I painted. As a result, some of the paint rubbed off. It was easy to just re-spray it, but I would definitely recommend doing this FIRST!! I used Zinsser Cover Stain Primer b/c I bought it to prime some furniture due to it's rave reviews. I worked at Home Depot a few years back for almost a year & learned that Primer can make a huge difference. It helps your paint stay on better and gives your color a more even appearance. For something this simple, you could probably get a 2-in-1 paint/primer though. All Primed & Ready to Go! Finally, I used 2 coats of black Rustoleum gloss enamel. This is basically a 2-in-1 paint & topcoat. I've been experimenting with spray paints a lot lately and I really think Rustoleum is the best! They have a big variety of colors & types of paint, and I've been pleased with everything I've used. 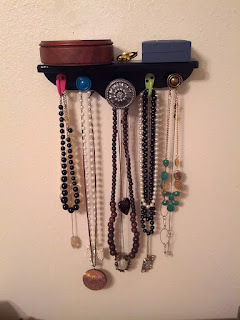 I thought I saw a necklace holder online that used a variety of hooks and drawer pulls found at the thrift store. I loved this idea & was able to find a really cool antique silver drawer pull with a sunflower on it...but that was it. 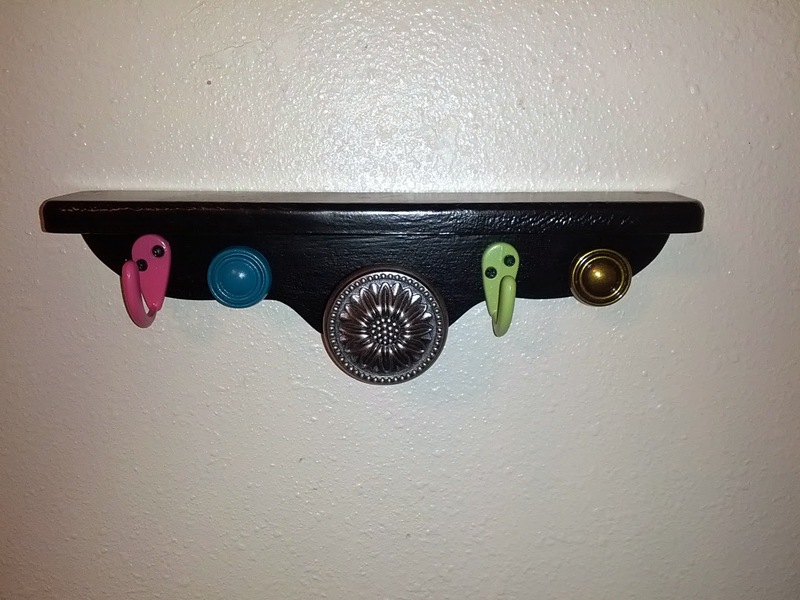 So I got some hooks & drawer pulls at Walmart & painted a couple with some spray paint I had for some other projects. I added some clear enamel on top so the color wouldn't wear off. 5. Attach to wall & enjoy!! I'm renting & didn't really want to attach my necklace holder to the wall with screws. I found an excellent solution from Target. 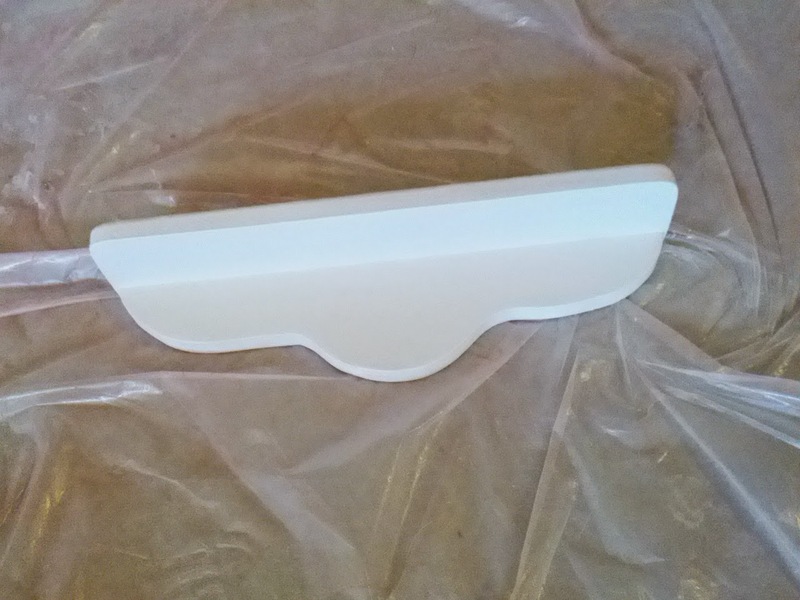 I purchased some Command plastic robe hooks their a while ago that had removable foam tape. I went back to see if they sold the tape separately (Dad's idea--he helps me so much with this DIY stuff!) and I found these "Picture Hanging Strips" that can hold up to 12 lbs! You attach 1 set of foam strips to your frame (or shelf in this case...and I used 3 strips for mine) then use a 2nd set to attach to the wall. They stick together in a velcro-like fashion, so it's relatively easy to remove the shelf from the wall, then remove the strips when the time comes. I waited about an hour after attachment before adding the necklaces and jewelry boxes & everything felt quite sturdy. Finally, I put it near my homemade earring holder (see my previous post here) so not only is it functional, but adds a design element. I LOVE how it turned out & how much easier it is to get to my necklaces now! 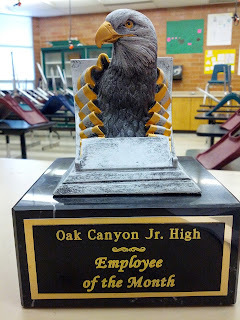 We're about a month into summer break and I wanted to share what my 1st year of teaching was like. If I could describe it in one word, it would be: WOW. I got married 1 week before school started and was not at all prepared for the stress ahead of me. 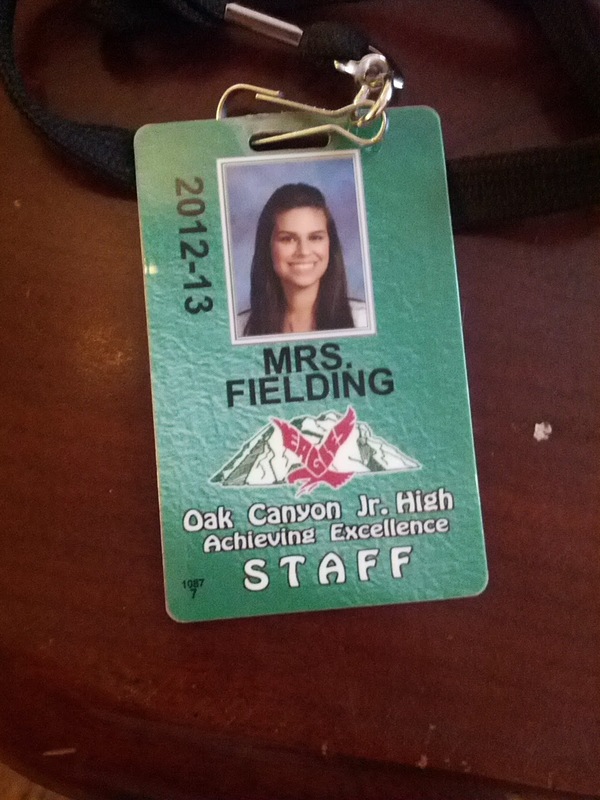 The first semester was really hard for me (and typically is for first year teachers). Did I mention that I was an intern? I taught the whole school year as if I were a certified teacher when, in fact, I had no experience! Each day I was frantically trying to come up with a good lesson for my students, I was learning how to teach, and how to manage my classroom. However, I was not without help. I had an amazing adviser from BYU that would check up on & help me weekly, along with exceptional teachers in my department that really paved the way for me to teach successfully. I actually was teaching at the junior high school that I attended 12 years ago and taught along side with many teachers that used to have me as a student. This was definitely an ideal school & district to have an internship in. Things started off exciting, but quickly went downhill when all of my health problems (migraines, back problems, & anxiety) amplified a LOT during this period. 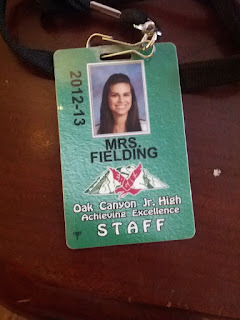 I was getting too overwhelmed & didn't think I could keep teaching. 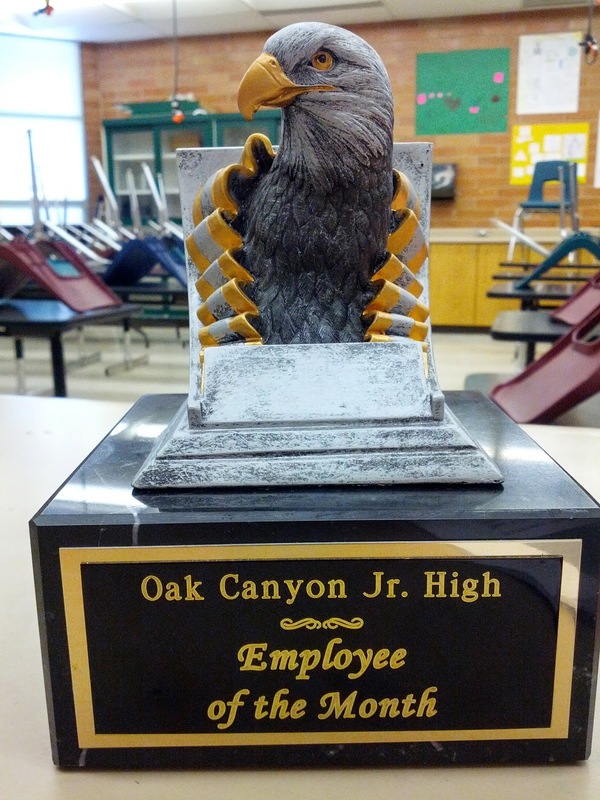 However, with help from my parents, doctor, as well as that from the other science teachers and administrators at Oak Canyon, I was able to get things under control & finish what I started. One thing that helped A LOT was adjusting my class schedule for 2nd semester so that I'd only be teaching 7th grade instead of both 7th & 8th (cutting my lesson preparations in half). 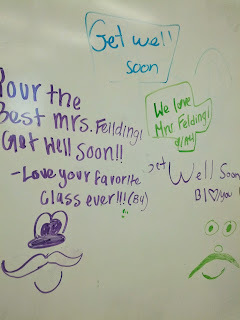 I was sad to see my 8th graders go, but in return I gained some amazing 7th graders. 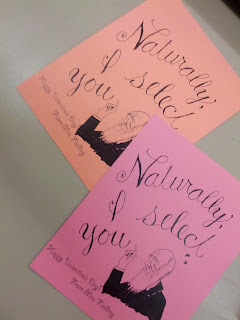 2nd Semester was the time when I really got to know my students better and enjoy & improve upon my teaching. This is when I realized that I chose the right career! Small moments like seeing a student understand a concept really well or receiving acknowledgement from a student or parent that I had helped them made EVERYTHING worth it! It takes an immense amount of work to be a good teaching, and seems to be something I'll have to consistently work towards. But I can't imagine much that is more rewarding & fulfilling in a career. 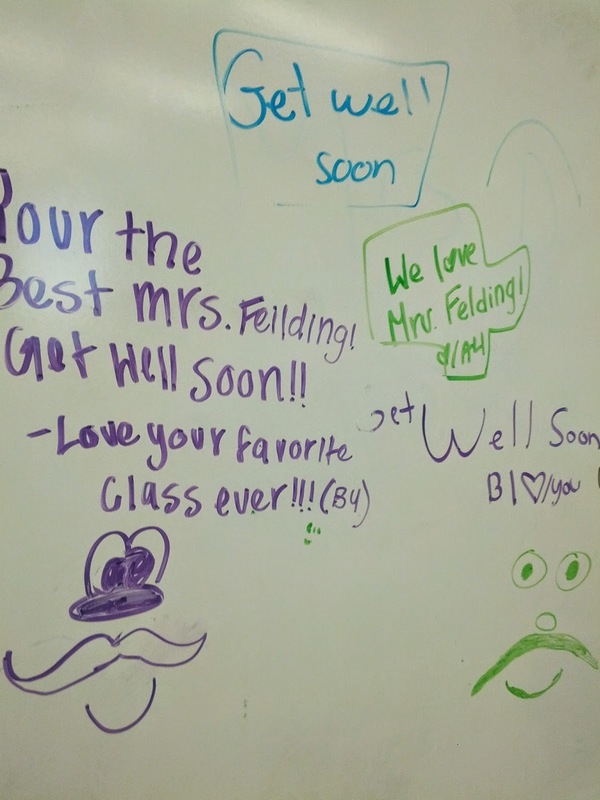 I'm looking forward to teaching next year (although I'll be teaching at a different school due to lack of funding) and am grateful for my awesome students from the 2012-2013 school for making me want to stay a teacher for the rest of my life! Mochi is a kind of rice cake that originated in Japan using finely ground rice flour. It has kind of a sticky texture and is used in lots of different ways! Mochi cake with coconut is a more Hawaiian version of cooking with rice flour, but keeping that Japanese influence. If you've never had mochi products before, TRY THEM! The sticky texture is kind of weird at first if you've never had it before, but it quickly becomes addicting! When I lived in Hawaii, a beautiful woman named Maria taught me how to make Mochi cake (aka Butter Mochi). I LOVED it! I never got the recipe and hadn't made it since Maria taught me, but my friend Teresa (awesome friend also from Hawaii) got a recipe and shared it with me. Here's an example of what Mochi Cake looks like. Due to my lack of photography skills & equipment, I borrowed this photo from this blog. This photo shows mochi cake WITHOUT coconut. I personally think the coconut is a must as it adds a great flavor and texture! 1. Preheat the oven to 350 degrees F (175 degrees C). Grease a 9x13 inch baking dish. 2. In a medium bowl, whisk together the eggs, vanilla and milk. In a separate larger bowl, stir together the rice flour, sugar, and baking powder. Pour the wet ingredients into the dry ingredients, and stir to blend. Mix in melted butter and coconut. Pour into the prepared pan. 3. Bake for 1 hour in the preheated oven. Top will brown & sides will separate from pan. Cool completely, then cut into squares to serve. I was a little worried that it wouldn't turn out right since Utah is much drier & at a higher elevation than Hawaii, but it tasted & looked just like I remember!